Now that the basic idea of health care reform has finally limped across the finish line with both the House and the Senate having voted for different seriously damaged versions of what the public actually wants, Republicans have started crying, “But we never had a chance for any input!” And President Obama, bless his pointy little head, decided to have a televised love fest where the official protectors of business will get a chance to show how little they think of the bill, whether accurate or not, and give Obama the chance to magically make everyone happy by his words. BULL! The Republicans had ample chance to influence what was in the bill, had they not been sitting on their hands and saying that they were going to make health care Obama’s Waterloo. They didn’t give a snap of the fingers what was or what wasn’t in the bill until it actually passed and there appeared some glimmer of hope that the most expensive health care system in the world might actually become the fifteenth best instead of down in the dismal 30s somewhere. Now that the train has left the station, like the villains in an antique horse opera, it’s time to ride hellbent for leather over to Perilous Chasm with dynamite to wreck the train. Obama’s not going to give them the dynamite tho’, no sir, he just runs the livery stable to give the boys a good start trying to get to the chasm before the train does. 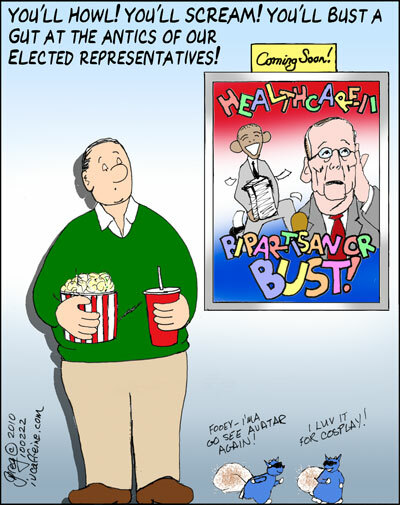 I’m not sold on the present form of health care reform: in fact, I think it kinda sux. It isn’t single payer, the only SENSIBLE alternative to what we have; it has no public option, its limpwristed cousin, even if there’s still a pulse in that supine body; and it includes a mandate forcing everyone in the United States to make the health insurance vampires richer. But would somebody please explain to me Obama’s sick fetish with bipartisanship? As Arianna Huffington pointed out the other day, slavery wasn’t repealed with a bipartisan compromise, it took a @#$%^&* war. And Americans are being forced into an economic servitude where they do not have health insurance, they are OWNED by the insurance companies and dare not move from the one they are subject to lest they lose coverage over a pre-existing condition. Sounds to me like an unfree condition. Not only that, but health care is driving our economy into the crapper. As costs for medicine, health care insurance rise and rise, it’s become one of the major facets of the American economy. That’s just crazy! Communism didn’t bury us, but we need to get a handle on health care before we’re buried by our own Capitalism. The health care bill isn’t going to reverse this, but at least it will slow it down. So I have one thing to say to Obama. Tell the Republicans to defecate or decamp. Don’t compromise this thing any further if you don’t want PASSING health care reform to become your Water “loo”.